A fascinating exploration of the contents of Agatha Christie's 73 recently discovered notebooks, including illustrations, deleted extracts, and two unpublished Poirot stories. When Agatha Christie died in 1976, aged 85, she had become the world's most popular author. With sales of more than two billion copies worldwide, she had achieved the impossible - more than one book every year since the 1920s, every one a bestseller. 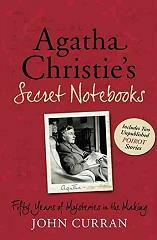 But when archivist John Curran began deciphering the notebooks, the extent of this treasure trove became apparent!This book lifts the lid on Agatha Christie's biggest secret - how her pencilled notes, lists and drafts led to her many successful books, plays and stories. Alternative plots, titles and characters, deleted scenes, even her plans for the books she didn't get to write - John Curran's investigation reveals a wealth of unpublished material, including two complete Hercule Poirot short stories never before published: The Incident of the Dog's Ball and the unseen thirteenth Labour of Hercules!